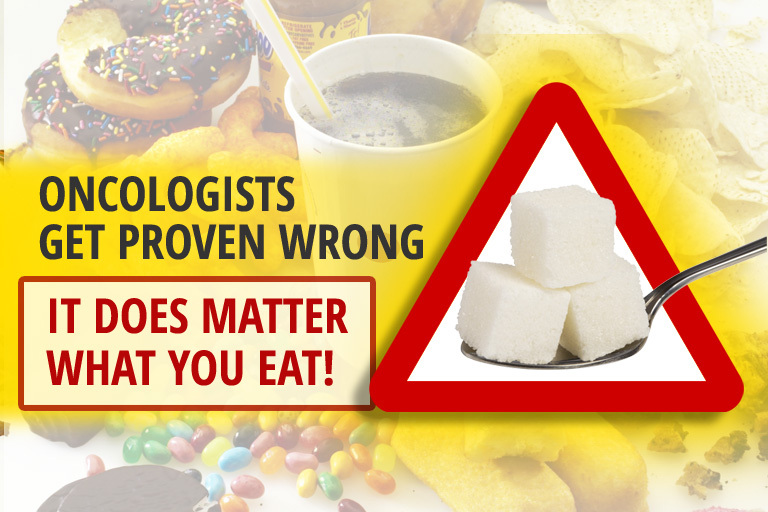 Oncologists Get Proven WRONG - It Matters What You Eat! You are here: Home / Cancer Prevention / Oncologists Get Proven WRONG – It Matters What You Eat! How many times have you heard or been told by a doctor that it doesn’t matter what you eat if you have cancer and cancer patients are encouraged to eat whatever they want? This ONE thing PROVES they are completely wrong and HAVE TO APOLOGIZE to all these cancer patients and their families. Cancer cells are glucose metabolizers. Their only source of fuel for survival is SUGAR since their mitochondria are damaged. 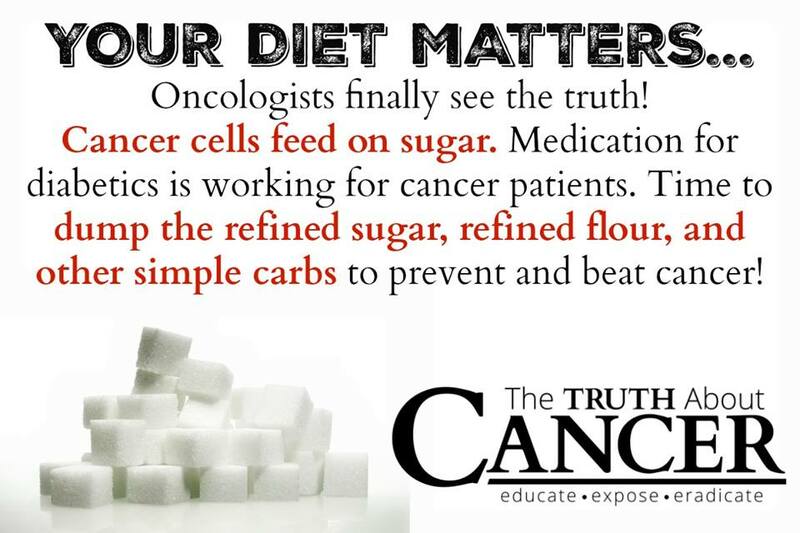 Based on continuous research, it is clear that sugar feeds cancer. That’s why the PET scan uses radioactive glucose to detect cancer cells. The simple mechanism of tagging glucose molecules with radioactive indicators that light up when the cancer cells ingest them further confirms that doctors are aware of cancer’s weakness for sugar. Now oncologists are using diabetes drugs on cancer patients to keep sugar out of the blood and decreasing the amount cancer cells take in! It shows they are taking the initiative to find better treatments than chemo, surgery, and radiation. They are getting closer to finding cause(s) of cancer. The Cause is the only Cure! In a meta-analysis of 20 papers involving over 13,000 patients reported by Dr Ming Yin et. al. in The Oncologist (November 15th 2013), the researchers concluded that metformin helps increase survival rates in cancer patients with type-2 Diabetes, better than other plasma glucose-reducing drugs. The Editor of The Oncologist, Bruce Chabner, said this study had removed concerns that metformin might have some causal effect, and could actually play a part in tumor reduction by helping to lower plasma glucose levels. As we repeatedly tell readers, glucose is the primary fuel for cancer cells. What’s great about this is, it PROVES that lowering sugar and blood glucose levels increases SURVIVING and decreases the risk of cancer. The bad news is they are using a medication with many side effects (although nothing compared to chemo and radiation). But when there are so many natural/safe ways to heal from cancer, why wouldn’t you do these instead? Stop eating SUGAR and anything that turns to sugar. That means ALL grains, pastas, carbs, breads and most fruits − at least during the initial phase of reversing cancer. Measure blood sugar levels throughout the day with a glucose meter to ensure you’re keeping glucose down while simultaneously keeping INFLAMMATION down. Monitoring your blood sugar is one of the keys I teach to every cancer patient. Here are some dietary supplements may also help maintain healthy blood sugar levels. Dr. Charles Majors has devoted over 16 years to studying health and healing to prevent and reverse diseases through natural methods. He graduated from University of Illinois with a bachelors of Science and went on to receive his doctorate degree from Palmer College of Chiropractic. In September 2010 he was diagnosed with an incurable bone marrow cancer that metastasized to his brain. With only weeks to live, he left conventional medicine and applied the same principles he had been teaching for years to reverse his own cancer. He learned not only to survive but to thrive. Because of this experience he co-wrote his third book, "Cancer Killers - The Cause is the Cure." Well said like how you said things. I searched The Oncologist website so that I could read the study mentioned in this article but could not find it. What I’ve read about Metformin (diabetes drug) is that some studies have shown that it might be effective at treating some types of cancers but no studies have proven that it prevents cancer. In fact a study mentioned in Science Daily stated that women who received metformin before being diagnosed with breast cancer had double the mortality rate than women who had never taken it previously. It was effective only after the diagnosis was made, showing the drug is time-sensitive. The data that is known about Metformin does not support the theory that sugar causes cancer.